The Cottages of Curry Creek is located in Nokomis in south Sarasota County. 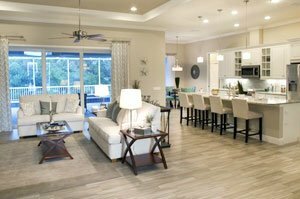 This community was developed by custom builder Tivoli Homes which has an outstanding track record in the Sarasota real estate market. Tivoli started developing The Cottages of Curry Creek sometime in 2015 on a parcel off Colonial Lane about a kilometer east of U.S. 41 (Tamiami Trail). Also just half kilometer west of Colonial Lane’s junction with South Albee Farm Road, this property was developed as a gated enclave with 12 home lots. The community’s land parcel, just like its neighboring properties, is in a mini-peninsula between canals that feed southward into Curry Creek. 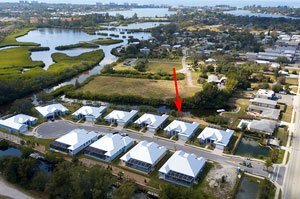 Each home site in this property is platted at least 10,000 square feet in size backed up to the water and fronting the community’s cul-de-sac street, Wooden Skiff Court. With this layout, available homes for sale at the Cottages of Curry Creek impress prospective buyers with their private boat docks providing access to Roberts Bay westward via the serene waterway just south of the community. Outdoor kitchens and private swimming pools are additional delights for these waterfront residences. The homes in this community are all semi-custom, Key West-style cottages with spacious, covered front porches that lend added charm to the neighborhood. More than their style, Tivoli Homes has ensured that the residences of its Curry Creek development are durable and energy-efficient. 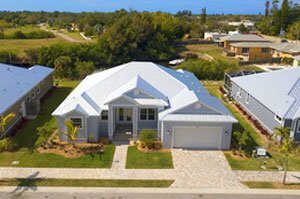 This Sarasota-based builder incorporated in the community’s residences wind-resistant metal roofs, impact-resistant hurricane glass windows and doors, and spray foam insulation on their structures. Curry Creek residences were likewise built with fiber cement siding over concrete block, and the construction methods used follow green home standards. Additional home features include high-efficiency air-con systems and heat pump-style hot water heaters that make these builds eligible for Energy Star rating. A standout at the Tivoli Curry Creek neighborhood is the builder’s 2,265-square-foot design which garnered the best overall in its category during the 2016 Sarasota Manatee Parade of Homes. It was also adjudged “best in curb appeal,” and tied in the citation for “best kitchen” and “best floor plan.” Designed with three bedrooms and two baths, this model has a quoted price in the $600s. Pricing of smaller builds at the Cottages of Curry Creek starts from the high $400s. One of such design was sold pre-construction in September 2017. Featuring three bedrooms and two baths, the floor area this of residence measures 1,843 square feet. Living in this Tivoli-developed community offers the unique experience of close proximity to the 80-acre Curry Creek Preserve of mangrove forests, tidal marshes, and flatwoods that serve as a thriving habitat for birds and other wildlife. Besides water-based recreational activities, residents of the Cottages of Curry Creek are just minutes away from the life and leisure hubs in Venice offering shopping, dining, recreation and entertainment. The popular Legacy Trail is likewise just a short distance to the west of this community, allowing biking and running on a carless path all the way north to Palmer Ranch in Sarasota. Trips via U.S. 41 open access to even more lifestyle delights as this highway is lined with a motley of commercial and business centers all the way north to Sarasota’s downtown district. Below are the current real estate listings available at Cottages of Curry Creek.